The Haven, a high-end lakeside gated residential development in Ipoh, Perak, is attracting investors from Hong Kong, Vietnam and Singapore who are looking for holiday homes in Malaysia. The RM250 million project is developed by Ipoh-based Superboom Projects Sdn Bhd, and features three 26-storey blocks of luxury condominiums. Chief executive officer Peter Chan said The Haven is unique as it has natural settings with picturestique backdrop. Each block has 165 units overlooking a 1.6ha private natural lake with running water, a 14-storey high monolithic limestone rock formation, and the existing 280 million-year-old limestone hills. The units are available in 12 configurations - panoramic corner, lakeview, central lakeview, two- and three-bedroom bungalows in the sky, duplex and penthouses and garden units. Chan said The Haven is aimed to be among the first developments to embark on all feasible avenues of harvesting nature's renewable, sustainable resources such as wind, water, bio-gas and pro-active mechanical resources to power and maintain common areas. He said the condominiums will be the highest and the most expensive development in Perak, setting a benchmark of modern living. Chan added that almost half of the first block has been sold since the unveiling of the project in Tambun, Ipoh, about one month ago. "Majority of the buyers are up-graders from within Ipoh. The project has met our expectations in terms of sales. We believe the remaining units will be snapped within the next few months. "We are now getting the attention from foreign property seekers and will open for sale the second block by the end of this year. We are bullish on the market," Chan told Business Times in an interview. The regular units range from 958 sq ft to 2,840 sq ft, while the penthouses range between 3,743 sq ft and 4,345 sq ft. The units are priced from RM250,000 to RM1.4 million each. "We spent three years designing this project. Our philosophy is to deliver attractively designed and finished homes to purchasers. Much attention is given to details so no renovation is necessary when the owners move in," said Superboom co-principle David Yam. Yam said the five-level security from the entrance of the driveway leading up to the entrance of each floor, in addition to a fenced-up parameter and regular patrols was another selling point of the project. Superboom will be introducing The Haven to home buyers in Kuala Lumpur tomorrow on a special invitation basis. NUSAJAYA: Global Capital and Development Sdn Bhd will be launching three mixed property development zones in Medini, near here, in the last quarter of the year. Millennium Development International (MDI) Malaysia country manager Richard Polkinghorne said earthwork and laying of infrastructure facilities at the three zones started a year ago and were progressing well. He said the master plan developments for the three zones had been approved by the Iskandar Regional Development Authority (Irda) and the relevant authorities. “We’ve hosted strategic investors from all over the world for site visits and many of them have expressed their strong interest to invest in the projects,” Polkinghorne told StarBiz. Beirut-based MDI is managing the development of the three zones – the two Lifestyle and Leisure Zones and the Iskandar Financial District in Medini – on behalf of Global Capital and Development. The company is a member company of the Jordan-based Saraya Holdings, a real estate development and asset management group involved in developing large-scale tourism and leisure properties. The Lifestyle and Leisure Zone is divided into two sites – the North Zone on a 235ha site comprising a theme park, shopping centre, medical specialist centre, schools, offices and medium and high-end residential properties. The South Zone, on a 280ha site overlooking the Straits of Johor and Singapore, will have lower density residential developments such as villas, a golf course, boutique retail centres, as well as a health and wellness village. The Iskandar Financial District sits on 142ha and will have mixed-use areas anchored by the diverse activities that take place in the international financial centre. It will also be the regional nucleus to spearhead financial innovation. “The three zones will be developed over a period of 15 to 20 years with a gross development value of approximately US$20bil,” he said. The company was upbeat that the projects would be able to attract investors and buyers as there had been growing evidence of an upturn in the property market. He added that as the economic situation started to show signs of gradual improvement, there were likely to be more investors and individuals looking for good investment opportunities all over the world. “The economic crisis has taught investors to be more realistic and cautious in their investments portfolio and they now want to see reality rather than imaginary projects,” Polkinghorne said, adding that the crisis was a blessing in disguise as it would be much easier to convince investors to invest in Medini in Nusajaya with massive infrastructure work being done on the site and the ongoing government support. Medini’s 970ha area is sited on the 9,307.76ha Nusajaya. The latter is one of the five flagship development zones in Iskandar Malaysia. The other four are the JB City Centre, Western Gate Development, Eastern Gate Development and Senai-Kulai. Polkinghorne said Iskandar Malaysia itself was a good branding as the country first economic growth corridor had strong backing from the Federal Government and Johor Government, Irda and Iskandar Investment Bhd. Polkinghorne said Medini would be able to attract not only Singaporean investors but also international companies and expatriates based in the republic to invest there. The development of Medini is undertaken in partnership between the private and public sectors with key investors – namely IIB, Mubadala Development Co, Aldar Properties, Kuwait Finance House and MDI. The overall development of Medini is divided into four distinct zones with separate themes: The Lifestyle and Leisure North, Financial District, Medini Central and Lifestyle and Leisure South. SUPERBOOM Projects Sdn Bhd, a privately held property developer, plans to focus on one or two projects at a time to ensure the quality of its work. "We have received offers to develop land. We are keeping our options open," said chief executive officer Peter Chan. Superboom was set up by Chan and his partner, David Yam, in 2002. Chan is the former chief executive officer of bereavement care provider NV Multi Group Bhd while Yam has over 20 years of experience in the construction and project management industry. He started work with Sunrise Bhd and was involved in Mont Kiara Phase 1. Subang Galaxy in Subang 2, Selangor, comprising 175 double storey terraced houses. Chan said the two projects were completed ahead of schedule and prices have appreciated by more than 30 per cent since completion. "Our focus for the next three years is on The Haven. 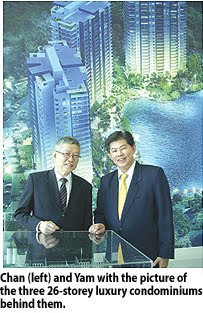 We hope to sell all the units within the next two years," Chan said. The Haven is a high-end lakeside gated residential development in Ipoh, Perak, with three 26-storey blocks of luxury condominiums. Each block has 165 units. StarProperty.my spoke to Real Estate and Housing Developers’ Association (REHDA) chairman and Metro Kajang group managing director Datuk Eddy Chen about the New Economic Model (NEM) and addressing the housing affordability gap. “I would suggest that the government raise the income of the government servants. 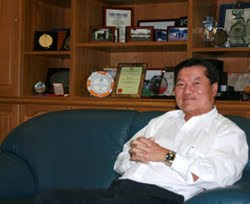 They can lead the whole high-income movement,” says REHDA chairman Datuk Eddy Chen. What are your thoughts on the recently unveiled New Economic Model (NEM)? Chen: I think that the NEM, if it is carried through is very good for the country. And it may be make market much more equitable. For example, let’s say if the Prime Minister said to take care of the bottom 40% of the people, irrespective of race, that would be good. Because then, you take care of Chinese, Indian and Malay as well. Then it is fair, because it is (on) needs-based. The only grouse that we have is the pricing of low cost houses, which developers are subsidising RM15,000 to maybe RM20,000 per unit. We believe that there are not that many people who fall into that category now. Out of the bottom 40%, how many percent of people will qualify for the low cost housing scheme? Chen: It may well be 5% or maybe 10% of the 40% that falls into that category, which we believe the government is fully capable of taking care of these people via general taxation, without involving subsidies. Because for subsidies, the costs are passed on to medium-cost house purchasers. They are footing the bill for this. If the government takes care of low cost housing, would that mean that prices of houses would be lower? Chen: Across the board, for developers, it is like this. We work on a margin. Say Metro Kajang, we look at land and we work backwards. I want a margin of say, 15%. Then (we) work backwards and price the house accordingly. So if take away low cost housing, certainly my margin will remain, but it may be at a lower absolute figure. Therefore, if you look at lower figure that means the price of houses is actually lower in absolute terms. And of course, developers also do take into consideration the market demand of the house. If the market price is say RM500,000 per unit, the developer will price at RM500,000 per unit. (We) won’t overprice to RM600,000. Or below, because if I invest in a property at RM500,000 and later if the subsidy of low cost housing is removed, my property’s value might remain or even drop. Chen: Then you (will) find that following of buyers will reduce. So we try to price ourselves to the market but of course we work at a margin. So it is a dual thing – market and margin. Because you see, in terms of affordability, the government can help in many aspects. You take away bumiputera quota. The 7% (bumiputera discount) subsidises the rich bumiputera as well as poor bumiputera. It is not (on a) needs basis. But if you do away with let’s say, anything above RM250,000, they will get a discount. Some suggested instead of RM250,000, look at RM500,000. Any house above RM500,000, we do away with the bumiputera discount. That way, it will help affordability a lot more. Bumiputera quota and low cost housing - if we take these away, developers will still work on a margin of some sort, and price to market. The absolute figure might actually come down. That will help affordability and of course there are compliance costs like TNB (Tenaga Nasional Berhad), IWK (Indah Water Konsortium) and water capital contribution. All these are privatised entities. Developers come up with capital and they collect the long-term income. So perhaps look that they (utilities companies) fork out their own costs and price in their tariffs and take it back over the long term. So at the end of the day, these are some of the things that can bring (property) prices down, make houses much more affordable and when we say affordable, we are talking about (property being) affordable to (the) middle class. Because they are the bulk of the population. Yes, because they (the middle income group) don’t qualify for low cost housing and at the same time, can’t afford many of the properties built these days. Chen: So, if we can take care of the middle class, which is probably the majority of Malaysians, I think the middle class may constitute 60% to 70% of Malaysians. But even if the government does decide to do away with the bumiputera quota for properties above RM500,000, the middle income group is still stuck in the trap. Chen: Everybody will get a lower price. The price will move to a new equilibrium if we can take away some of these structured costs. But over time, inflation will take over and will slowly push the cost up. So this is one way. Of course the other way is that NEM is talking about bringing Malaysia to a high-income economy. I think that is more critical, in the sense that, high-income must be linked with productivity and add value-add. Income must value-add and it must be more than the physical income. Malaysia aims to make that quantum leap from the current USD7,000 per capita annual income to USD15,000 in 10 years. But in 10 years, property prices would’ve inflated quite a bit too! Chen: (The) thing is that when we move up, the input into housing, the raw material, the service, the value-add will be more. Because of this value-add, price goes up. You may be looking at new technology of building houses. Better quality houses, more guarantees in terms of houses, guarantees in delivery system. So if (we) transform the housing (industry), although it won’t be a revolutionised thing, but the incremental increase in quality, the specifications would certainly commensurate with (the) higher price. But then, of course you are earning higher income and salary. And (the) built environment will be much higher. In 10 years’ time, we may not be building the same house. Quality is improving every day. (We) build greener homes, houses that save more water, save electricity, safer house. What is the point of having high-income if we stay in the same type of houses. So it must actually be meaningful. Everything must be better. If you look at say Ringgit Malaysia, (it) will eventually go up. But be mindful that other countries such as Australia, Singapore might have gone up as well. So in relative term, we must move faster than Singapore or Australia. But the thing to us is that we have more room to grow than a matured economy. You mentioned green homes. Fact is, it is not cheap to go green at the moment, be it for existing building or new buildings. Will this move be even more of a burden and enlarge the affordability gap? Chen: Actually, (being) green will increase the price but we are looking at the incremental increase. Because the house cannot be totally green at the moment, so we could be looking at maybe increasing certain features over time. Certainly we are hoping to incorporate green features that will help savings. For example, certain green features save electricity, use less light, use less water. And although the price will increase but over time you save. So we are working on is figuring out the feasible ROI (return-on-investment), and we are waiting for the feed-in tariff (FIT) to come from the government. Do you have any idea of the percentage increase of income versus property prices? Chen: Property prices tend to move faster than income, and many a time this is caused by little bit of speculation. For example, price of some houses I have sold in Kajang, prices have increased by maybe 200% over the last 20 years, but pay has not increased by 200%. In many instances, some (properties) have increased by 300% or 400%. But generally, pay has not increased much, especially for government servants. Unfortunately for the poor people, there is a myth that the government is helping the low income people to own properties as an investment. But many low cost houses, when you look around, Kajang, Rawang, Kuala Langat, the low income people bought at RM42,000, and today they are selling only at RM20,000 to RM25,000. These poor people have become poorer! They are caught in the trap. We believe the government is wrong in that sense, to build low cost houses irrespective of location. And low cost houses, the other problem is that there is lack of maintenance. People are not paying subscription, not painting the houses, no sinking fund. Some of these low cost houses, it is like a slum. Somehow government must come to understanding that these poor people, maybe it is better for them to rent than to buy a house that is in a poor location with poor maintenance. So that is a myth that developers building low cost houses are helping them as an investment. As a home, yes of course, a roof over their head. But as investment, it is a losing proposition. So, when household income increases, we will have a better quality of life. Apart from that, what are the other expected spin-offs when people have higher income? Chen: Not just for housing (industry). I would suggest that the government raise the income of the government servants. They can lead the whole high-income movement. With more to spend, the Ringgit goes around to boost the economy. Imagine, they buy more things from hypermarkets. These hypermarkets now feature locally-produced items, which are purchased from SME (small and medium enterprises) in this country. (When) the consumption increases, this has big multiplying effect. We need for studies to be done for this. That is the theory of it all. If you can move government servants’ salary (up), there is justification for everyone to move salary (up), to new income salary equilibrium. But it must all be done via productivity. For example, instead of taking six months to approve a plan, it takes three months instead. That is huge savings and that savings can be passed back to everyone else. When (we) get everything (done) faster, on the global picture, Malaysia becomes that much more competitive. These are the things that income can help generate this kind of effect and government servants play (a) crucial role. 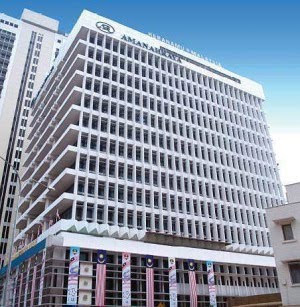 AmanahRaya building in Kuala Lumpur. ARREIT plans to better manage its existing assets. SUBANG JAYA: AmanahRaya Real Estate Investment Trust (ARREIT) is targeting to grow its total assets to RM1.5bil in the next two years from RM748mil currently by injecting new properties into its portfolio and improving the value of its existing assets. ARREIT manager AmanahRaya-REIT Managers Sdn Bhd chief operating officer Abas A. Jalil said ARRM was now evaluating the possibility of injecting more properties into its REIT. “We are looking at acquiring office buildings, warehouses and hotels in the Klang Valley, Penang, Johor Baru and Kota Kinabalu. “These buildings have a similar asset class. They have reputable tenants, a long-term lease and generate a stable income stream,” he told StarBiz after ARREIT unitholders’ meeting yesterday. Abas said ARREIT unitholders had passed the resolution for the acquisition of Selayang Mall (in Selayang) and Dana 13 in Ara Damansara for RM227mil. The acquisition, to be completed by early next month, would boost its total asset value to RM1.002bil. He said ARREIT was buying the properties at a good value. “We have carefully evaluated the assets. For Selayang Mall, the tenancy mix comprises good brands while Dana 13 is the corporate headquarters for Symphony House Bhd. They moved into the premises in late 2009 and they are under a guaranteed lease for 10 years,” he said. Abas said plans were in place to better manage its existing assets. “We are talking to all our lessees for the future enhancement of their asset values,” he said. He added that the acquisition of the two properties would allow ARREIT to provide better returns to unitholders. “We are looking at 7.29 sen for this year after the acquisition of the two properties,” he said. ARREIT returned 7.15 sen to each unitholder in 2009. Guocoland Ltd, the developer controlled by Malaysian billionaire Quek Leng Chan, said China’s efforts to avert a property bubble has encouraged the company confidence to double its investment in the country. Guocoland, whose projects combine shopping malls, apartments, offices and hotels, said a year ago it planned to invest 33 billion yuan (US$4.8 billion) in new commercial properties in China. Property prices in China surged by a record 11.7 per cent in March from a year earlier, prompting the government to announce measures last week that increased the size of down payments, raised interest rates on second homes and barred banks from funding purchases of third homes. Guocoland’s new investments will focus on integrated projects in major cities like Beijing and Shanghai as well as provincial centers, Lee said. The company is also considering expanding its land holdings. The Singapore-based developer, part of Malaysia’s Hong Leong Group, aims to increase its investments over about two years, Lee said. She also sees a “big, big opportunity” in the Chinese government’s demand that 78 state-owned companies exit the property market because real estate isn’t their main business. The company plans to take advantage of the move through “mutually beneficially working relationships,” she said without elaborating. China yesterday ordered developers not to take deposits for sales of uncompleted apartments without proper approval and barred them from charging “abnormally high” prices. Real estate prices in Haikou, capital of the southern island of Hainan, jumped 53.9 per cent last month. The average cost of land in 105 Chinese cities rose 8.1 per cent in the first quarter from a year earlier to 2,700 yuan per square meter, the Ministry of Land and Resources said yesterday. The government’s measures to cool the housing market won’t have any “major impact” on Guocoland as they mainly target residential projects rather than the company’s main operations, Lee said. KUALA LUMPUR: Fraser & Neave Holdings Bhd (F&NHB) expects to gain RM21.98 million for the sale of 1.44 acres of partly developed land along Jalan Ampang here for RM53.8 million. F&NHB said on Thursday, April 22 the freehold land is being disposed of to Star Residence Sdn Bhd. "The proposed disposal would enable the F&NHB group to immediately realise the profit from the disposal. Elsinburg has todate incurred a total development expenditure of RM28.06 million including land cost. "It is estimated that upon the successful completion of the proposed disposal, the F&NHB group will derive a gain of RM21.98 million after deducting all fees, costs and expenses related to the proposed disposal," it said. F&NHB said the proposed disposal of the land was together with a development order and approved building plans for two blocks of serviced apartments, signature offices and retail outlets, collectively called "Ampang Hilir 233 Project".